Many people just think of “Prosecco” as a sparkling white wine, but it is so much more. Like many fine wines from renowned global wine regions, it is named for the place it calls home. The area is Conegliano Valdobbiadene (KOH-neh-L’EE’AH-noh |VAHL -dohb-BEE’AH-deh-ne), the homeland and birthplace of Prosecco. The vintners of this region, situated 50 km from Venice and around 100 km from the Dolomites, are the keepers of an ancient territory. It was here in the hilly countryside where the French Charmat method, with secondary fermentation in pressurized tanks instead of the bottle, was further perfected in Italy. This method is used to produce the drier, more elegant sparkling wine styles Conegliano Valdobbiadene is known for. Furthering the antiquity, with century-old vines, Conegliano is home to Italy’s first winemaking school, which opened in 1876. The history and place of this area are so significant that the region is on the list to be considered as a UNESCO World Heritage Site. A UNESCO recognition will prove that not all Prosecco is the same. The Conegliano Valdobbiadene area, comprising only 8,088 hectares of total vine, and producing only 20% of all Prosecco, was awarded the prestigious DOCG designation in 2009. Many soil types co-exist within it, ranging from sand to clay and those rich in minerals. These varying terrain and microclimates create different growing and harvesting requirements for the 181 producers, 433 vinifying companies, 3387 families and 15 municipalities of the province of Treviso between Conegliano & Valdobbiadene. Conegliano is in the eastern part of the Conegliano Valdobbiadene DOCG. The lands that surround Conegliano are rolling hills. Grapes grown around Conegliano typically have intense fruit flavours, with floral notes and some minerality. In contrast the western hills of Valdobbiadene are rugged and steep. Viticulture here is heroic, where growers harvest the steepest grades with ropes tied around their waists to protect them from falls. Some vineyards have bucket-and-pully systems to bring the ripe grapes in. Wines made from grapes grown in this area tend to be creamier, showing a balanced mix of white fruit flavours and citrus with floral hints. The full name of the sparkling wine is Conegliano Valdobbiadene Prosecco Superiore DOCG. Look for the area Conegliano Valdobbiadene on the label, and “DOCG” on the quality sticker around neck of the bottle, to be assured of top-quality terroir-driven Prosecco Superiore. Within the Conegliano Valdobbiadene Prosecco DOCG, there are two designations called Rive and Cartizze, which indicate wines that come specific areas within the region. “Rive”, in local dialect, refers to the steep hills that are characteristic of the zone. Rive wines are made exclusively from hand-picked grapes grown in 43 different hamlets and villages. These wines are often obtained from the most precipitous, laborious, high-quality vineyards, and made from grapes grown in a single commune. In addition to “DOCG”, the vintage is always shown on the label, and Rive wines have the name of the specific commune on the label. The Cartizze zone has had its own specific regulations since 1969. Labeled “Superiore di Cartizze”, the grapes in this zone cover only 107 hectares and are grown and produced in three tiny hamlets within Valdobbiadene. A visit to a region is the best way to truly understand it. 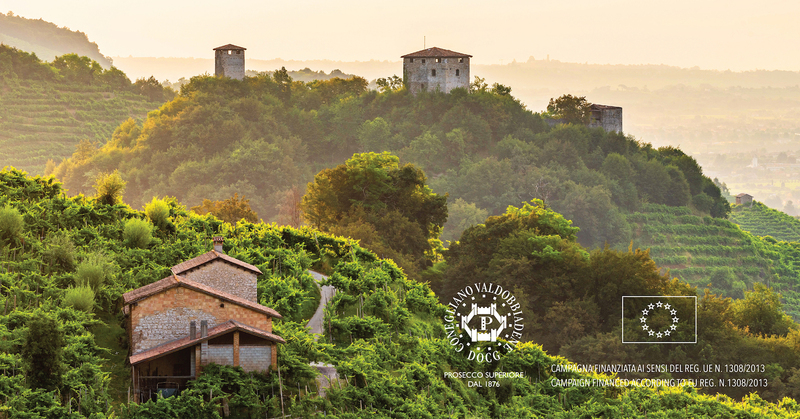 Drive the Prosecco Road to discover cultural treasures, taste the local cuisine and experience events first hand. Trip itineraries can be found at www.prosecco.it.